“Connecting”—whether with authors, suppliers, publishers—as well as learning and staying on top of what is happening in the publishing world is one of the best reasons to be a member of IBPA. And networking with like-minded people and experts to learn from is what IBPA’s Publishing University is about. Coming together as one, we keep independent publishing alive and thriving. This past May, Donna Essner, one of my Amphorae Publishing Group business partners, and I attended Publishing University in Salt Lake City. I was the happy recipient of the SLPA scholarship which covered registration fees. (I recommend everyone enter to win the scholarship next year!) Upon arrival, we were met with a plethora of information, services, and assistance available in every area of independent publishing, and print and ebook distributors, printers, wholesalers, website developers, retailers, and experts on public relations/promotions were on display and available for consultation—and for making new friends. Even shy writing types are encouraged to network, mix, and mingle, and to learn from one another. One comment from Kwame Alexander, keynote speaker and 2016 Newberry winner, struck me in particular. “Go wherever,” he said. “Be vulnerable. Be prepared.” This advice is not just for authors alone. It’s a mantra even we publishers should remember. And if you’re self-publishing, it goes double! Be bold. Experiment. Put your whole self out there. Of particular interest to author/publishers are the workshops and panel discussions given by successful marketers, publishers, and authors, who openly and happily share their success stories—and their failures—to help the rest of us succeed. Learning from the mistakes others have made, in particular, helps us achieve our goals and that of our authors. Throughout the conference, we found that everyone we met shared their knowledge willingly, no matter the question. And fellow attendees are just as eager to learn from what we, at Amphorae, have learned. As a writer, traditional publisher, and self-published author, I eagerly devoured all the information—or as much as I could ingest!—I could get my hands on. In fact, I highly recommend you go with a friend or colleague so you can each attend different sessions and then share notes. One particular bit of advice to keep from being so overwhelmed with everything available to IBPA attendees, is go with a plan. Decide what you want and need to learn and focus first on that. But, to reiterate Kwame Alexander, “Go wherever. Be vulnerable. Be prepared.” Just go. 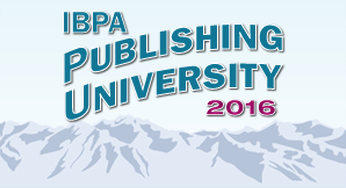 IBPA Publishing University is one destination that I recommend to everyone on the publishing journey. SLPA doesn't talk much about the art of writing, leaving that to the St. Louis Writers Guild, except that writers should consider who their readers will be and how to speak (write) to that audience. But, K.M. Weiland has an excellent article on how to write scenes to keep the reader happily interested. Follow the links in the article, too, for more good information. I hope you know you cannot just use any photo you find online for your book or website or blog. Most are copyrighted and require specific permission and even payment to use. Do not think you can just tell who the photographer is and they will be happy (same with using other peoples' written words). You may even be in trouble using your own photos! Below is an enlightening article by photographer Jean Gill about the use of photos for commercial purposes. Note that nowadays in the US, gardens and parks may also require permission and payment to use photos taken on their grounds. How to Write the Best Author Bio. Joel Friedlander talks about proofreading and how reading aloud is not just for kids. This post provides details about the 5 Parts of the Book You Will Write, in addition to the book itself. A must read if you thought your contribution ended with the content! Maintaining point of view - important! Editor Rachel Newman has an excellent article on Joel Friedlander's blog on editing your work for point of view - of course, don't rely on yourself to catch all the errors. Who is telling your story? Be sure to maintain this point of view throughout, unless you are really good at knowing how and when to switch.